English (Translate this text in English): Jeffreys Ledge is a large glacially-created feature, stretching 33 miles from offshore of Rockport, MA to Cape Elizabeth, ME. Dive charters departing from Gloucester run special trips upon request. Jeffreys Ledge is a large glacially-created feature, stretching 33 miles from offshore of Rockport, MA to Cape Elizabeth, ME. Dive charters departing from Gloucester run special trips upon request. English (Translate this text in English): On the northern edge of NOAA's Stellwagen Bank National Marine Sanctuary, rocky ridges on the southern edge of Jeffreys Ledge rise to within 115 feet of the surface. The shallowest portion of the ledge is comprised of piled cobble and boulders. Anemones, stalked tunicates, and coralline algae reside on the rocks making for a colorful landscape when illuminated with a dive light. The ledge’s piled boulders create a complex structure with many crevices for marine fishes like cusk and wolffish. On the northern edge of NOAA's Stellwagen Bank National Marine Sanctuary, rocky ridges on the southern edge of Jeffreys Ledge rise to within 115 feet of the surface. The shallowest portion of the ledge is comprised of piled cobble and boulders. Anemones, stalked tunicates, and coralline algae reside on the rocks making for a colorful landscape when illuminated with a dive light. 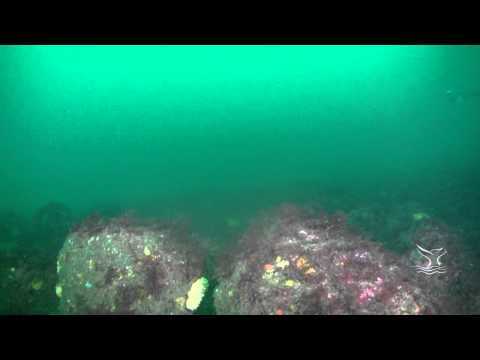 The ledge’s piled boulders create a complex structure with many crevices for marine fishes like cusk and wolffish.